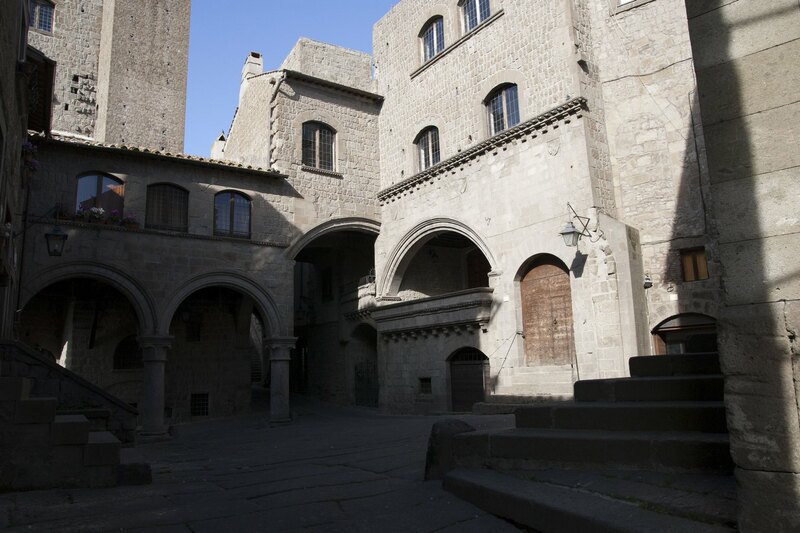 A city of 65,000 inhabitants and the provincial capital, Viterbo is the true “beating heart” of Tuscia. The city saw its greatest splendour in the middle ages, but its history is a long and varied one. Viterbo was first settled by the Etruscans, whose settlements were discovered right on the hill where the Cathedral now stands; in Roman times, the city became a strategic intersection along the busy Via Cassia; later, it came under Lombard rule, during which time the city centre was rebuilt over the old centre (in Latin, Vetusurbs, from which the current name Viterbo derives). In the 12th century, work began on the city’s massive defence walls, which are wholly intact even today. The material used was peperino, a characteristic local stone of a sombre grey colour. The various gates providing an opening in the walls (Porta Romana, Porta Fiorentina, etc.) lead to the medieval town centre, including the splendid quarter of San Pellegrino, Palazzo dei Priori and Palazzo dei Papi. Palazzo dei Papi, or the “Popes’ Palace”, is so called because it was the place chosen by the Roman popes as their abode for several decades. They adding buildings and monuments to Viterbo, turning it into a city of worldwide importance: for instance, from 1268 and 1271, the longest conclave in the history of the Church was held here (to appoint the successor to Clement IV, who was Gregory X). Yet Viterbo is more than just history: one of its strong points is the local cuisine, which you can enjoy in a variety of excellent restaurants; not to mention its famous thermal waters, or its many fountains, some of which are 13th-century sculptural masterpieces. Viterbo also has an international flavour: the University of Tuscia hosts students from throughout the world. And every year, in early September, the city celebrates its patron saint, an event you won’t want to miss: the macchina of Saint Rosa, a special tower-like structure, is carried through the city in a ceremony that was declared UNESCO World Heritage in 2013.